Military medal awarded to servicemen who fought for the Soviet Union in the Great Patriotic War (WWII) against Germany. The medals are gold to copper in colour, and hang from ribbons with pins on the back. The medals themselves have a profile of Stalin recto, a small hammer and sickle and star verso, and Russian inscriptions on both sides. Recto reads: Our cause is just. We won. 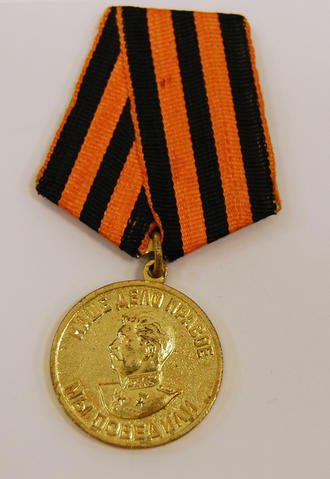 Gold-coloured medals' verso reads: For victory against Germany during the Great Patriotic War 1941-1945. Copper-coloured medal's verso reads: For valorous work during the Great Patriotic War 1941-1945.
recto: Our metter is fair/we will win; verso: For the victory over German in WW 0f 1941-1945.